The Yeshiva mourns the tragic death of Har Etzion Hesder talmid Uriel Peretz Liwerant z"l who died al Kiddush Hashem in a tank accident during a training exercise in the Golan Heights on Wednesday, August 5, 2009 (15 Av). Uriel, the tank commander, was killed and three other crew members were lightly injured. Uriel, 21, of Efrat, was born in Jerusalem to American olim parents, Aharon and Joni. He is buried in Har Herzl in Jerusalem. "Uriel personified gentleness and at the same time, readiness to lead, as he showed as the commander of his tank," said Rav Yaakov Fischer, Rosh Yeshiva of Neveh Shmuel High School, where Uriel studied before beginning his Hesder studies at Yeshivat Har Etzion. Rav Fisher described Uriel as "a real tzaddik, a brilliant student who would have become a Talmid Chacham." His father remembers a Shabbat afternoon not long ago when Uriel, who was home on leave, decided that instead of catching up on much-needed sleep, he would walk to the Yeshiva "to hear some sichot and learn a little." He says that Uriel loved the Yeshiva and loved the army, and did everything with simcha. 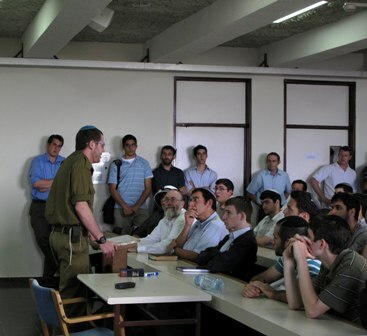 On Tisha B'Av he uncharacteristically gave a shiur to his whole unit even though he didn't like public speaking. Yona, a member of his tank crew said: "He had a mischievous smile. He was a simple person – that is to say, uncomplicated. He never yelled, never argued, never complained. He always helped, always acted with happiness. He was the one who always carried the jerican and wouldn't let anyone switch with him. His last words were: "Tzevet Tirgolet Ha'ta'apuchot," words which saved the lives of the others in the tank. Adds another friend: "He had a golden neshama, he always had a smile on his face. He learned daf yomi even during active duty, during crazy hours, after training exercises, late at night. On Shiva Asar B'Tamuz, we were given time to rest because of the fast but Uriel was outside taking care of the tank, covered in grease, while we were all indoors." On his shloshim, a Siyum of Shas Mishnayot took place in the Yeshiva in his honor and hespedim were given by Harav Mosheh Lichtenstein, Rav Etan Ansbacher, Rav in Neve Shmuel, and Yonatan Orich, a friend. 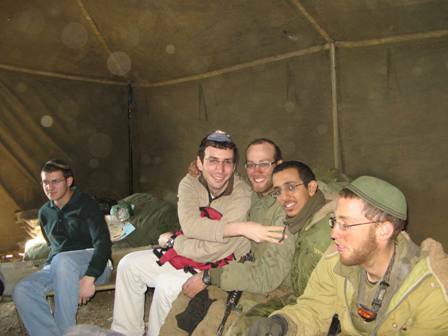 "When I joined the Hesder Program at the Yeshiva, I didn't really know the chevra and on Lag Ba'Omer, two years ago, I headed sheepishly to a bonfire that the Israeli guys had made. It was then that I first felt Uriel's warm hand give me a pat on the back – which I later discovered was his conventional greeting. He inquired who I was and introduced himself. From then, Uriel, in his incredibly humble and pure way, stood out in Yeshiva. He always (and I'm not exaggerating) smiled. He was a serious learner and in the Beit Midrash, he was always fixed to his seat, enjoying the depth of D'var Hashem. Yet, again, what I most remember, is the warm pat on the back." A group of Har Etzion bogrim met in the apartment of Benjy Gottesman '07 in Washington Heights to mark the shloshim. They sang songs, accompanied by Benjy on the guitar, and engaged in meaningful discussion about Uriel's life. Some shared their memories of Uriel as a friendly face and dedicated talmid of the yeshiva, while others read articles from Israeli newspapers written about him and his life. Benjy, having been a chavruta of Uriel's in yeshiva, was able to describe his personality and intensity to the group.